Dimensions 0.75 by 8.25 by 10 in. A volume of previously unpublished New Yorker cartoonist pieces, culled from the personal collections of thirty of the magazine's top artists, is comprised of their favorite rejected cartoons. 200,000 first printing. Amazon.com description: Product Description: Each week about fifty New Yorker cartoonists submit ten ideas, yielding five hundred cartoons for no more than twenty spots in the magazine. Arguably the most brilliant single-panel-gag cartoonists in the world create a bunch of cartoons every week that never see the light of day. These rejects were piling up in the dusty corners of studios all over the country. Sam Gross, who has been contributing since 1962, has more than 12,000 rejected cartoons. (Seriously. He's been numbering every single cartoon he's ever submitted to The New Yorker since the very beginning.) Enter editor Matthew Diffee. He tapped his fellow cartoonists, asking them to rescue these hilarious lost gems. From the artists' stacks of all-time favorite rejects, Diffee handpicked the standouts -- the cream of the crap -- and created The Rejection Collection, a place where good ideas go when they die. Too risquÃ©, silly, or weird for The New Yorker, the cartoons in this book offer something no other collection has: They have never been seen in print until now. 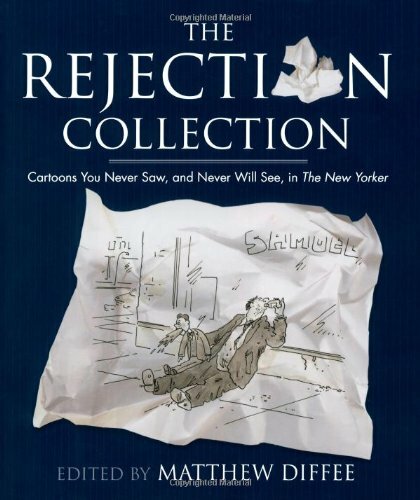 With a foreword by New Yorker cartoon editor Robert Mankoff that explains the sound judgment, respectability, and scruples not found anywhere in these pages, and handwritten questionnaires that introduce the quirky character of each artist, The Rejection Collection will appeal to fans of The New Yorker...and to anyone with a slightly sick sense of humor.